Ah, yes – I’ve added another nostalgic post on 2017 to your feed… but let’s be real, can’t we all appreciate this time where we excitedly look to something new, while closing the book on what this past year brought us? While everything post-Christmas is honestly just a little depressing to me, there is also this feeling of excitement and anticipation as a new year is ushered in — almost like that feeling when you stop, take a deep breath, and reset your brain for a few seconds before taking on whatever is next. So before the “deep breath” that is January 1st, I am joining many of you in looking back on 2017 with a grateful heart and appreciation for all that it brought us. It’s hard to believe that it has been almost a year since I promised you readers that you’d see more of me on the blog this year… and more importantly, with the prayer that you’d see more of God on the blog this year (you can read that post here). This resolution for the new year was at the very top of my list, as I sought to really use my writing to bring to life what God is doing in the every day. And wow, have I been so amazed at how the Lord has molded my heart through the challenge and excitement of this space. This year, we officially moved everything under the umbrella of “This Beautiful Life,” started the new “Simple Joys” series on this blog (a work in progress, but I love it all the same), and had the opportunity to see a lot of new faces and meet a lot of talented bloggers through this process. But more than any of it, I’ve been reminded at just how much I love to write – the way the Lord speaks to me through it, the way that it reveals what is happening in my heart through perfectly paired words that I didn’t know were sitting in my mind. And for all of you who have joined me in this journey throughout the past year, I am so very grateful. From milestones like celebrating our first anniversary and watching my little sister get married, to the small moments like soaking up a cold Saturday or learning what it means to be present, I can say without a doubt that 2017 was a huge growing year for me. Despite my many efforts to avoid this reality, I had to come to terms with the fact that more than anything, this year was one that God was calling me to be patient and to rest in His plans that are to come. It was a year of planning for what’s next, rolling up my sleeves and doing the “dirty work” to accomplish my lofty goals, and learning humility to be a better wife, a better friend, a better sister, and so on. I haven’t perfected any of it, but I know I’m a lot closer than I was a year ago. As for 2018, I look to the year ahead truly giddy for what is to come. Jordan and I have had a lot of plans and hopes laid on our hearts for what this next year will bring, and I am nervous, excited, stressed, hopeful, and truly joyful for it all. Wherever and however this year makes its mark on us, I’m excited to continue sharing it with all of you. In the meantime, I’ll leave you with some of my favorite moments from this year. As we all deal with the new year in our own way – some with sadness, some with joy, some with a desire to just forget this past year altogether – it is my hope and prayer for you that no matter what you have planned for this next year, that coming to know and love the Lord more deeply and intentionally will lead your plans. And if you ever want to have a conversation about that, you’re welcome to email me: jordancarmich@gmail.com. You’ve been a good one, 2017! Now: onward. When I got to staff the season kickoff at Daytona International Speedway, the WORLD CENTER OF RACING Y’ALL. WHEN WE WON THE NATIONAL CHAMPIONSHIP AND I CRIED HAPPY TEARS. When the HGTV (read: Fixer Upper) lover in me got everything she wanted at Magnolia Market in Waco, TX. When our “Baby Kate” became a teenager! When my sister got MARRIED. Y’all remember how that went. 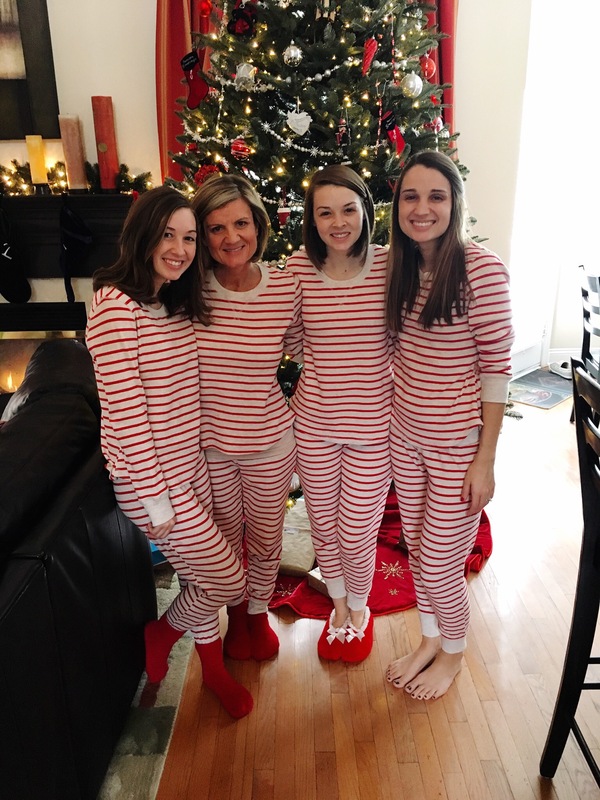 When I convinced my family to wear matching pajamas this Christmas. Great idea, right? !